Our Beautiful Granddaughter, Alex will soon graduate from HS. She has received a full scholarship. SUNNY332 is a SparkPeople Motivator! 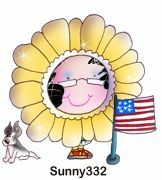 SUNNY332 is focusing on the JOY in my life. Welcome 2019, I am looking forward to setting some new goals and meeting those goals. 2018 was a tough year for me but I am not looking back, only look forward and what I can do now to be Happier and Healthier. Eat Healthier with a focus on fresh fruits and vegetables. Exercise at least 10 minutes a day or more. Spend time with God and in the word. Grow Spiritually. Look for the JOY that is in my everyday world. Focus on the positive and not he negative. Spend time with people who are happy. Laugh more & smile more. It just feels good!! My main goal is to Eat Healthier. I do believe you can not exercise enough to make up for a bad diet. A good mix of Cardio and Strength training along with dancing will be my program. I love to bike so it will be my "go to exercise". Focusing on Fresh Fruits and Vegetables and less carbohydrates. I live in Northeast Missouri - just North of Hannibal, Mo and Just east across the Mississippi River from Illinois. I am a Christian and know that He wants the best for me. My JOY is directly related to how grateful I am today and how I express that gratitude. SUNNY332 is focusing on the JOY in my life. Welcome 2019, I am looking forward to setting some new goals and meeting those goals. 2018 was a tough year for me but I am not looking back, only look forward and what I can do now to be Happier and Healthier. My Goals for 2019 Eat Healthier with a focus on fresh fruits and vegetables. Exercise at least 10 minutes a day or more. Spend time with God and in the word. Grow Spiritually. Look for the JOY that is in my everyday world. Focus on the positive and not he negative. Spend time with people who are happy. Laugh more & smile more. It just feels good! !